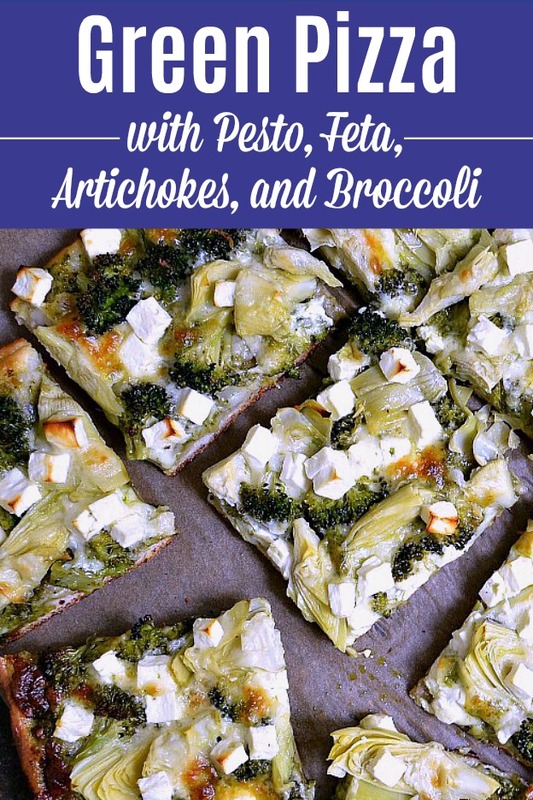 Treat yourself to this delicious Green Pizza with Pesto, Feta, Artichokes, and Broccoli … it’s one of my all-time favorite recipes, and it’s sure to become your fave, too! Before moving to New York, my husband and I lived in San Francisco. Our first few weeks there were a little uncomfortable, to say the least. Our furniture was being shipped from Chicago, and we spent a lot of time sitting on our air mattress. Let’s just say that I was very excited when our furniture finally arrived … ha! It was February, and after all of our moving expenses, I wasn’t expecting anything special for Valentine’s Day. Our plans were to order pizza and drink some wine. When I opened the pizza box, I was surprised by a heart-shaped pie (learn how to make your own heart-shaped pizza here). It was so sweet and made our night even more special! That pizza turned out to be one of my San Francisco favorites. We were lucky enough to have a great pizza place around the corner from our apartment, and that was the first time I had their Green Pizza with Pesto, Feta, Artichokes, and Broccoli. It was so delicious that I could have eaten it every day! Now we’re in New York, and it’s been over a year since I had that Green Pizza. I’m not sure what took me so long (especially since I love making my own pizza), but I finally decided to recreate it. 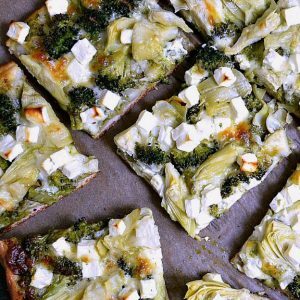 This Green Pizza recipe is packed with delicious ingredients! I made my own basil-spinach pesto, but if you’re in a time pinch, then feel free to use your favorite prepacked variety. It will still be super tasty. 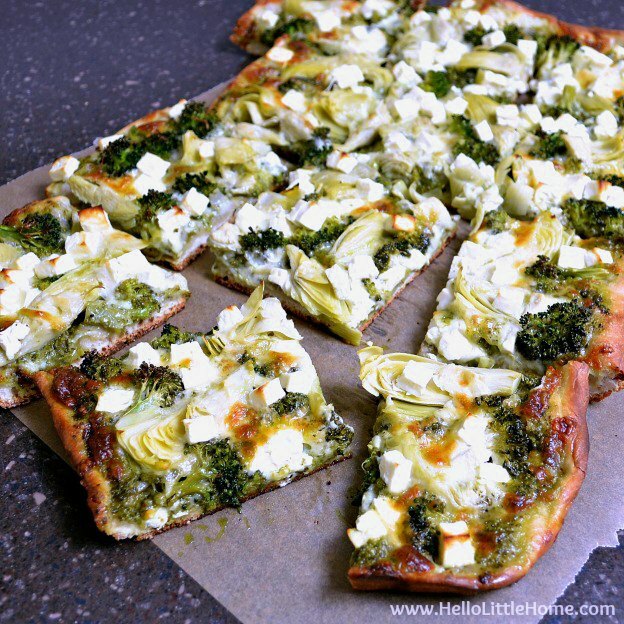 Next, you’ll top the pizza with fresh broccoli and artichoke hearts, just like they did at my fave pizzeria. It’s finished with a generous serving of tasty feta chunks and lots of ooey, gooey mozzarella. Yum! After you bake your pizza it’s time to eat … the best part for sure! 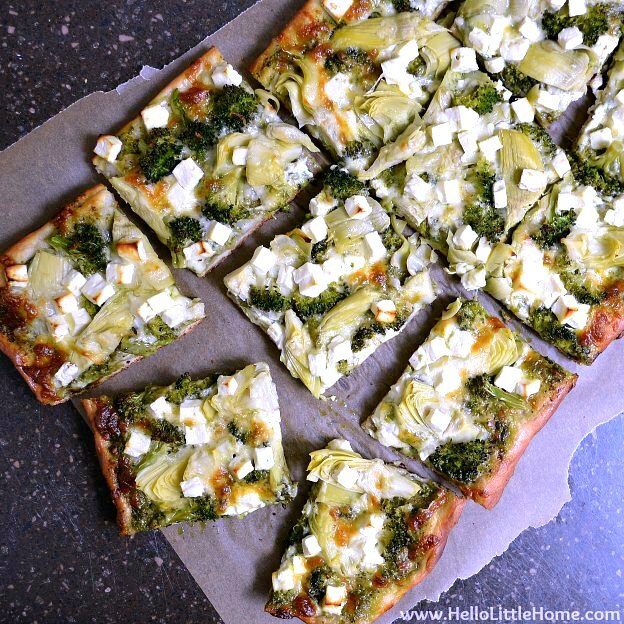 Give my Green Pizza with Pesto, Feta, Artichokes, and Broccoli a try. I know you’ll love it just as much as I do! Add walnuts to a small skillet over medium heat; cook until lightly toasted, stirring often. Let cool. Combine walnuts, garlic, basil, and spinach in a food processor; process until minced. Add Parmesan, olive oil, and salt and pepper to taste. Process until completely smooth. Set aside. Cut broccoli into small florets and place in a microwaveable dish with a lid. Drizzle with a couple tablespoons water, cover, and microwave until just tender (about 3-4 minutes). Drain water from broccoli and set aside to cool. Sprinkle 3/4 of the mozzarella cheese over the pesto. 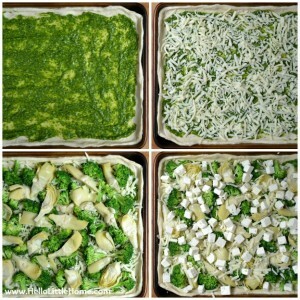 Evenly distribute broccoli and artichokes over cheese. Top with remaining mozzarella and then sprinkle with feta. Bake pizza for 25 to 35 minutes, or until crust is browned and cheese is lightly golden. Let cool slightly, then cut and serve immediately. Enjoy! 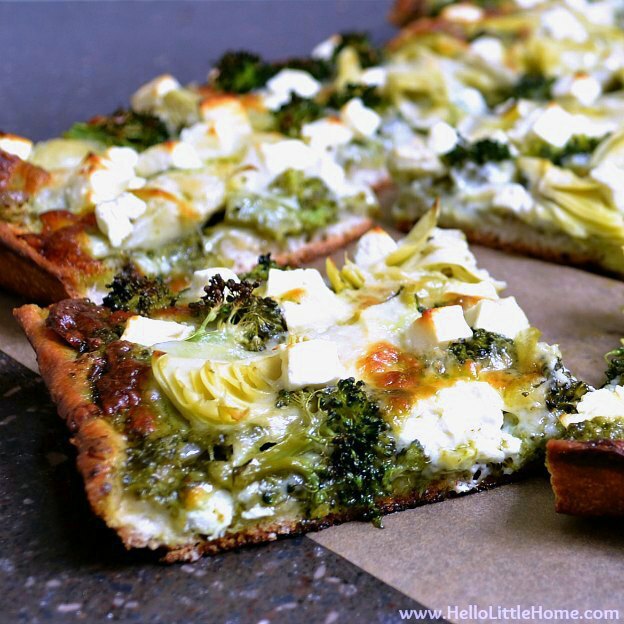 Wouldn’t it be fun to serve this Green Pizza for St. Patrick’s Day dinner? Definitely a fun, nontraditional St. Paddy’s Day idea … assuming you are not a corned beef fan, that is!